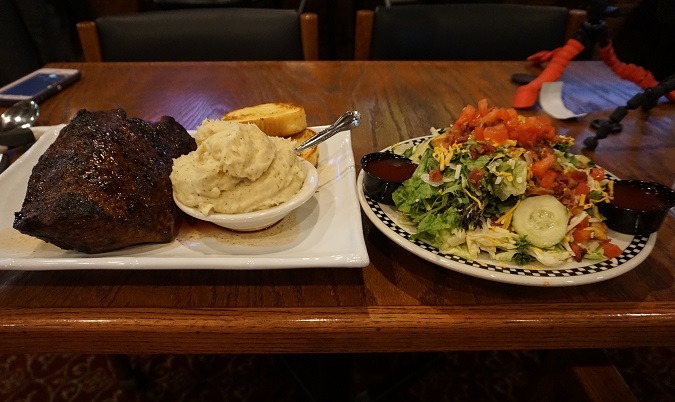 – 3 lb sirloin steak + side salad + large bowl of mashed potatoes + 2 pieces of Texas toast. – All fat and gristle but be eaten, but this is a premium cut, so there isn’t much. – The salad consists of mixed types of lettuce, shredded cheese blend, tomatoes, croutons, cucumbers, real bacon bits, and optionally your choice of salad dressing. It is a large salad that weighs about 2 lbs total. – You have 40 minutes to finish everything on the platter. – Wall of Fame photo with the Racks Gals! !